Loving this absolutely delightful children's story that I found in the library last week. It has been a much requested story at our house since then, so much so that Mylo can just about quote it word for word now! The boys were so into the story that when I suggested they make their own Peely Wally and baby bird they didn't need asking twice - this was our rainy Saturday morning activity last week. With one thing and another it had been aaaaaages since I'd taken the boys down to Te Papa for the afternoon. It was remarkably quiet being a Friday afternoon (and the day after the storm of the century here in Wellington) so we had the run of the place. When you spend an hour here you barely scratch the surface of all there is to see - on this visit we hung out in the natural world area, discovering all the native wildlife, watching the Colossal Squid movie, hanging out in the Discovery Centre, and discovering the position of the Southern Cross in the galaxy. Not forgetting the opportunity to crawl all over the North Island getting our bearings of where our friends and family live and all the places we have been. As the time crept closer to 5pm on the longest night of the year, we decided we'd better head home especially with the stormy southerly ready to pound us for Round 2 (it didn't stop raining all weekend). Which made it even more amazing that we were greeted with these amazing skies as we left Te Papa that night. From time to time, Mark takes his special recipe chocolate brownie in for the daycare teachers. This time they made they thanked him by getting the children to help make a special thank-you banner which Mylo was so excited to unravel and show Daddy when he got home. Loving having a hubby who is an awesome cook - way better than me (although I do try and hold my own in the baking stakes). Last weekend we got our usual $3 pizza dough from The Mediterranean Warehouse and Mark whipped up two very tasty, very different pizzas. The first was one we've had before but not for a while - Mince Potato and Rosemary pizza, and the other one which was a first was divine - Pear Camembert and Caramelized Onion. He got the idea as we'd had some nashi pears sitting on the kitchen bench not getting eaten so figured he might as well put them to good use and so googled 'Pear and Camembert Pizza' - God Bless Google! So it was a pretty good use of some otherwise unwanted ingredients if you ask me - an utterly unusual and delicious combination! I watched this trailer the other day for the official LEGO movie. It doesn't come out until April next year, but it looks like it is definitely going to be a good one to watch! And with the school holidays not far away I'm pretty sure there will be an abundance of kid's movies about to hit our screens soon too - Monsters University, Despicable Me 2 and Epic just to name a few! We had quite the unexpected science lesson last weekend when Mark brought in a funny looking item from the garden - it looked (as Sarah Lee suggested) like it could easily have been dumped in the garden by the storm - having been picked up from some far shore. During the day, we found a couple more of these strange exhibits in various stages of growth. But in fact, after a shout-out through Instagram and Facebook we discovered it was actually a fungus - a basket fungus and apparently common in NZ. Amazing to think that our Creator created this - an innocuous looking fungus but one that contains a special surprise that will pop out when it's least expected! Last week I got quite the surprise when my name was picked out to win an amazing boots and bag combo from Overland Footwear through Instagram. And they were super quick to deliver them - I had them in my hot little hands (or should that be on my hot little feet!) the very next day. Wow - talk about super service. And talk about feeling like a gal about town - this coming from someone who usually doesn't spend more than $50 on boots it was quite the moment of excitement for me in what was an otherwise pretty nondescript week! So......how are you holding up through these deep winter months peeps - if you're like me, you're probably feeling the need to dig a little deeper to find the moments to love amongst the days of cold, damp and rain. But if you're prepared to look hard enough for the nuggets of gold in the every day, I'm sure they really are there! Love those boots. So awesome! Such a cute craft too :) I need to get back to doing simple things with my little ones. 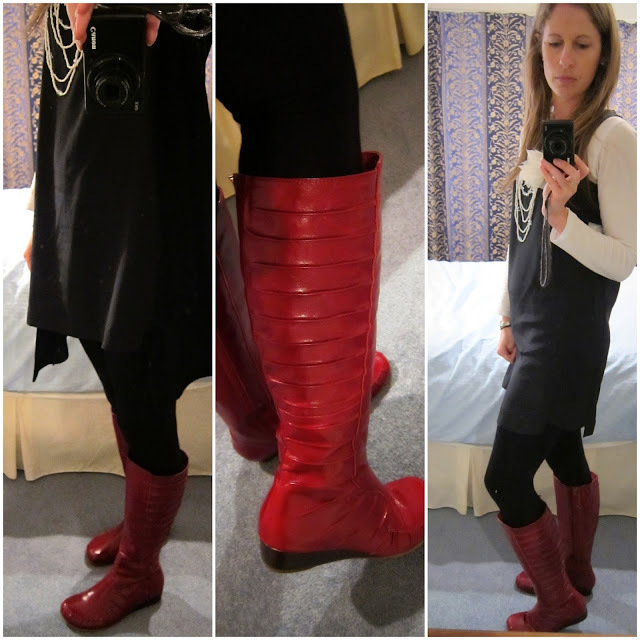 Those boots are amazing, my favourite is red....and you have a very clever hubbie whipping up such yumminess. Yum - the Pear Camembert and Caramelized Onion pizza. I have to say there wouldn't be any uneaten Nashi at our house, they are my very favourite! Oh and I'm crushing on those boots - have tried them on, so I know what a score you have there! !